Every year a yabusame tournament is held on the beach in Zushi (a town next to Yokohama). This archer is about to shoot the first of his three arrows from the back of his galloping horse. 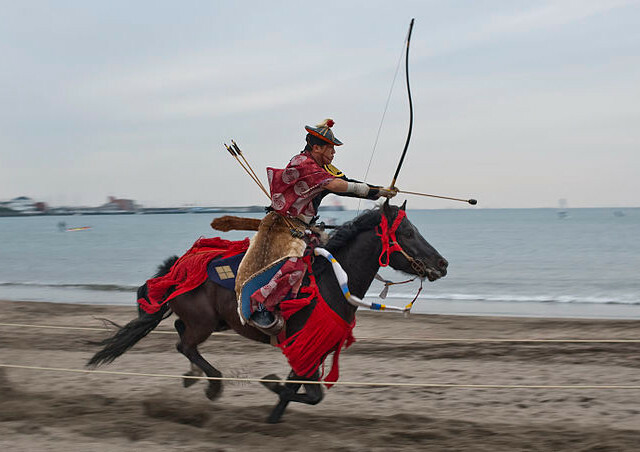 There aren’t many events that take place today exactly as they did in the twelfth century, but yabusame (horseback archery) is one of them. It originated as a way of training samurai in preparation for warfare, but it has always had close connections with Japan’s Shinto religion, and so is usually performed at Shinto shrines. Attending one of the yabusame events held around Japan each year is almost certainly the closest you’re going to get to meeting a real live samurai, and so is an opportunity not to be missed. Yabusame itself is very simple. An archer on horseback starts at one end of a roped-off track around 255 metres long, and gallops down it at high speed. Without stopping or slowing down, he fires three arrows in succession, each at one of three wooden targets placed about 70 metres apart on one side of the track. He then has to slow down quickly so he can stop before the end of the track – no mean feat given how fast the archers ride. The whole run is over in around 20 seconds, and the score is based simply on how many targets have been hit. Don’t let the simplicity of the sport (or ritual as most practitioners would prefer it to be called) lead you into thinking that it’s easy. The archers need to use both hands for shooting, so they have to rely on their knees alone to control the horses. As they let loose the arrows they shout ‘in-yo-in-yo’ – meaning darkness and light (the two opposite cosmic forces, sometimes called yin and yang). Hitting even one target is hard, and hitting all three is a major achievement – the mark of a supreme expert. 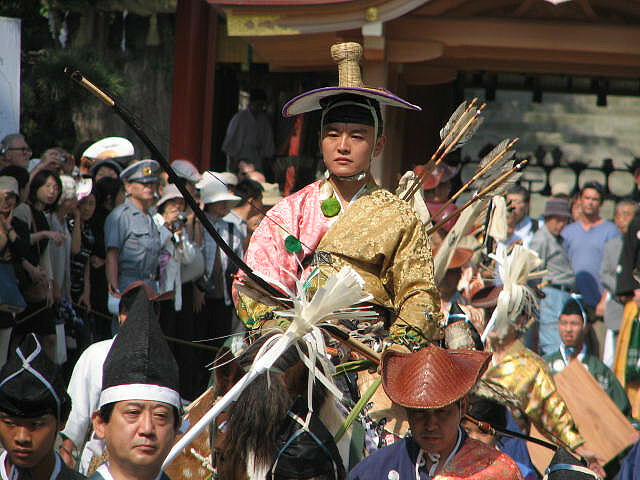 A procession at the Tsurugaoka Shrine in Kamakura, prior to the yabusame tournament. The arrows are topped with perforated bulbs of wood or deer horn so that they make a whistling noise when fired. This kind of arrow was originally used by samurai to alert the enemy before battle (unannounced attacks not being very honourable), but nowadays they have the advantage of making the sport less dangerous. (Shinto shrines don’t tend to have a lot of space, so the spectators are usually quite close to the targets.) Only the most experienced archers are allowed to use arrows with points on. In Japan, the bow has been a symbol of power since ancient times, and has been used on horseback since the fourth century. The ability to draw a bow and shoot accurately, even in the heat of battle, was seen as the ultimate mark of a true samurai, but it wasn’t until 1187 that horseback archery was formalized into yabusame. The first shogun, Minamoto no Yoritomo, was concerned that his samurai’s archery skills weren’t good enough, so he decided to create an event that could serve as a form of practice. The task of organizing the first Yabusame tournament fell to Ogasawara Nagakiyo of the Seiwa Genji clan, who was a tutor to Minamoto. The equestrian techniques and martial spirit of the House of Ogasawara has been passed down from father to son ever since. Patriarchs of the house served as tutors to powerful military generals right through until the nineteenth century. The Ogasawara School is now headed by Ogasawara Kiyotada, the 31st patriarch, a direct descendant of Ogasawara Nagakiyo. It is one of two major schools that currently teach yabusame and organize displays, the other being the Takeda School. That school is even older – it was founded by Minamoto Yoshiari in the ninth century, at the command of the emperor Uda. These yabusame judges at Zushi are dressed in armour, and each is carrying a pair of samurai swords. so he decided to use yabusame as a petition to the gods to seek a cure. As the rules of yabusame had been written down in the twelve century, it was possible to resurrect it and perform it again exactly as in ancient times. Happily, the gods obliged, and Ieshige made a complete recovery, eventually going on to succeed his father as shogun. As with kyudo (ordinary Japanese archery without horses), yabusame is a solemn activity, and is about a lot more than just equestrian prowess and skill with a bow. It was originally intended to increase both the mental strength and religious devotion of the samurai who took part, as well as honing their battle skills. To this day, a yabusame archer is expected to follow the principles of bushido (the way of the warrior), and so must respect God and his ancestors, and act with good manners at all times. The Ogasawara School even teaches its pupils the correct way of bowing and of opening and closing doors. Archers compete not for money, but for honour – the best performing archer is given a white cloth to signify divine favour, but receives no monetary payment. Even being selected as a yabusame archer is seen as a great honour – yabusame teachers are not paid, so their principle gain in passing on their skills is to increase their reputation by producing skilled pupils. Yabusame can be seen either as an offering to, or entertainment for, the gods (although we mortals are usually allowed to watch as well). Both the arrows that hit their targets, and the targets themselves, are kept and treasured as good luck charms. The Ogasawara also use yabusame as a form of weather forecasting. The count of the number of arrows that hit the targets is used to predict how good the harvest will be in the years to come. 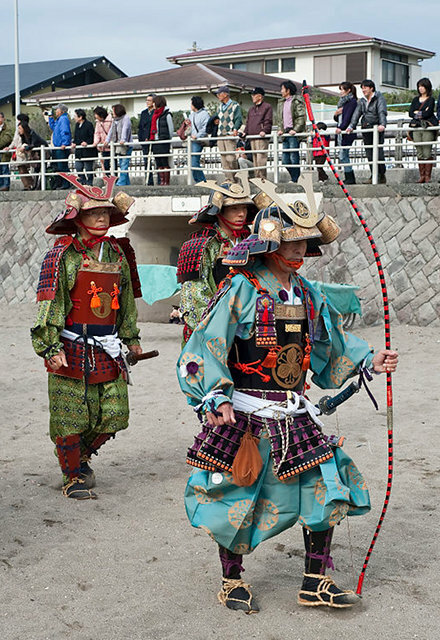 Yabusame archers are still equipped exactly as they were in the twelfth century. They wear medieval hunting outfits, including a distinctive woven-reed hat, a cloak, an arm guard, and a deerskin fur covers their legs. They carry a quiver of arrows on their back (from which they must draw new arrows as they gallop past the targets), a bow, a lacquered riding crop, and a pair of samurai swords – one long and one short. If you couldn’t see the other spectators, there’d be nothing to indicate that you weren’t in twelfth-century Japan – everything else is exactly as it was then. Well, except that samurai who performed poorly were sometimes required to commit seppuku (ritual suicide by disembowelling) – that doesn’t go on any more. The best thing is that you can get really close up to the action – only a rope fence separates you from the galloping horses. You can see here the narrow track at Tsurugaoka Shrine on which the the horses gallop, and just how close the spectators are to the action. The most popular place to see yabusame is at the Tsurugaoka Hachimangu Shrine in Kamakura – exactly the same place as yabusame was first performed over eight hundred years ago. In those days Kamakura was the capital of Japan, but now it’s a picturesque Tokyo commuter town, perfectly placed for a day-trip out of Tokyo. To get there take the Yokosuka line from Tokyo station, or the Shonan-Shinjuku line from Shinjuku station and get off at Kamakura. Either way the journey takes around an hour and costs 890 yen. The shrine is just a short walk down the road from Kamakura station. Throughout Japan there are about twenty yabusame events each year. The number of archers competing varies from just a few up to about sixteen. For details of displays run under the auspices of the Takeda School (including the Kamakura events), check out the events section of their website, or for the Ogasawara School’s events click here. The Japanese government also sometimes puts on special yabusame events to entertain foreign dignitaries (displays were put on for both Ronald Reagan and George W. Bush), and occasionally yabusame demonstrations have been given in other countries. 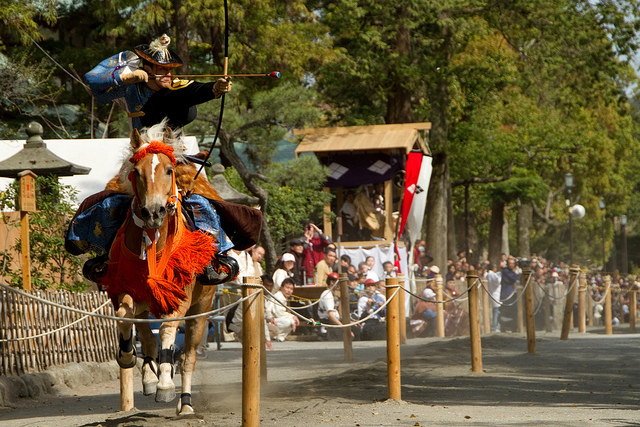 Wherever you see yabusame, the spectacle is sure to make a lasting impression.